"Good Day Sunshine" is a McCartney composition on which Lennon is thought to have contribted a very small portion of the lyrics. The interesting Beatles fact here is that the song was written at John's house on an especially sunny day, and McCartney claimed the song was influenced by the Lovin' Spoonful. It was recorded on June 8, 1966 at Abbey Road and released on Revolver. 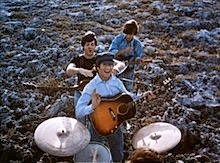 McCartney does the lead vocal, with Lennon and Harrison providing backing vocals. Starr plays drums and George Martin plays the piano, at times using a bit of a honky tonk style.